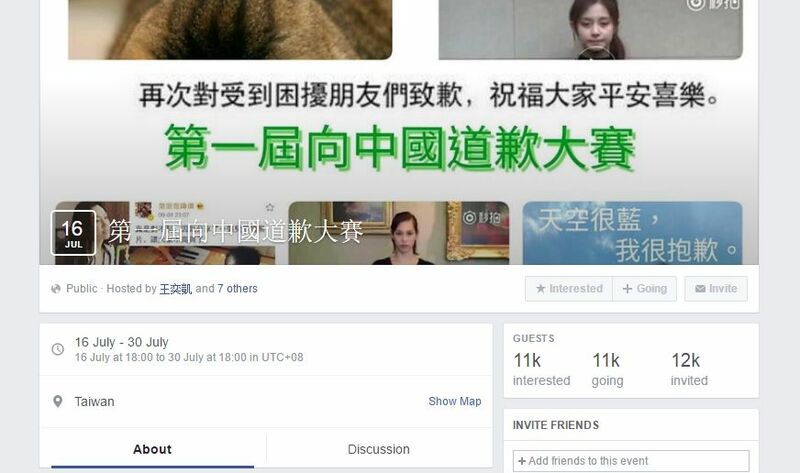 The “First Annual Apologise to China Contest,” a Facebook page encouraging people to post about how they have previously “wronged” China, has attracted many Taiwanese and Hongkongers to post “apologies” addressing controversial issues in China. 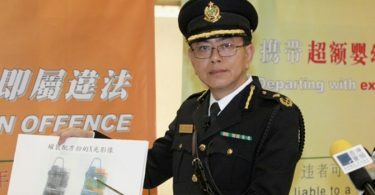 The competition was created by a Facebook user in Taiwan and surfaced after the apology of Japanese actress Kiko Mizuhara, who issued a video apologising after Chinese netizens accused her of being anti-China. Mizuhara allegedly Instagram-liked a photo which showed a person pointing the finger at Tiananmen in 2013. She said that she had done so to encourage her friend to post more pictures on the social platform and retracted the like within an hour after realising it was controversial. She was also accused by netizens of posing for photos at the Yasukuni Shrine, which honours those who died serving Japan. She denied that the person in the photograph was her. “I’m sorry…I didn’t eat everything on the periodic table once. I’m a terrible person,” said one post. Another apologised for having three children, while one said “I was looking throughout Hong Kong for new barlun shoes, but I could only find fakes, I’m very sorry.” His post was accompanied by a picture of a pair of New Balance shoes, the shoe brand which was recently ruled to be infringing upon the Chinese brand New Barlun in a Chinese court. The apology contest. Photo: Facebook screenshot. 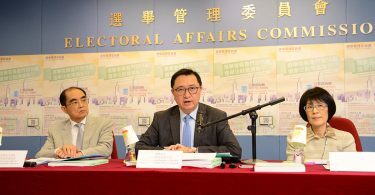 Another apologised for allowing mainlanders to buy foreign goods in Hong Kong because the territory “opened too many pharmacies.” Other issues that netizens apologised for include the use of traditional characters instead of simplified ones, as well as identifying as a Hongkonger or a Taiwanese instead of Chinese. Meanwhile, Chinese netizens also started a “First Annual Apologize to Taiwan Province Contest” on Weibo. “I’m sorry, your Taiwanese independence dream is destined to only be a dream, while our Chinese dream is getting fulfilled step by step!” said one. 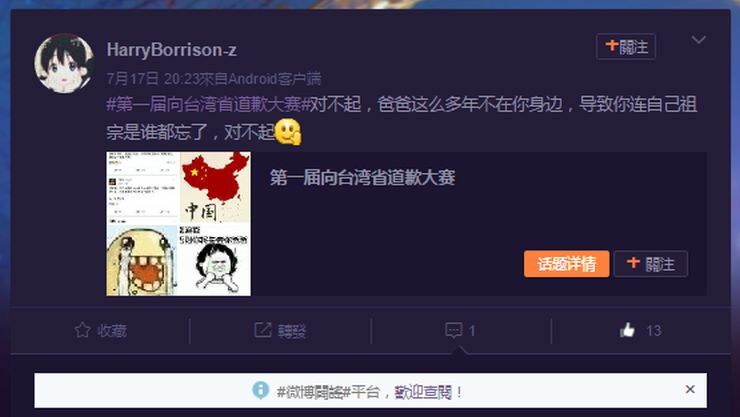 Chinese netizens start a contest apologising to Taiwan. Photo: Weibo screenshot. The person whose post wins the most Facebook likes will be crowned the winner of the competition. Previously in January, a Taiwanese member of the K-pop group TWICE, Tzuyu, also issued an apology in video after waving a Taiwanese flag in an online broadcast, leading to a backlash from Chinese netizens. Recently, Taiwanese actor Leon Dai was also dropped from his leading role in a Chinese film for allegedly supporting Taiwan independence. He later published a statement denying the allegation. Zhao Wei, the director of the film, previously supported Dai, but later changed her stance after Dai was dropped. She said that she would not forget her Chinese identity and that the nation’s interests will be prioritised above all else.